Origin: I scooped up Bounce from the bargain books section at my local Chapters store. The fact that it was in the bargain section upsets me, because it indicates that the book wasn’t selling sufficiently, which is really too bad since it raises some important issues and makes many incredibly valuable points. 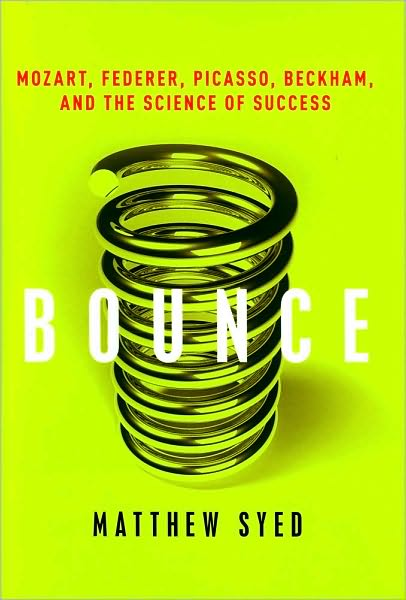 Summary: Bounce explores what it takes to achieve expertise in any complex task/field, using examples from both the athletic and non-athletic worlds, challenging long-held beliefs, and introducing powerful ideas that could change the world if embraced and applied. My Take: If you read Bounce (it’s written in a fluid manner and progresses quickly) and really take it to heart, then it could very well change your life. Incidentally, I don’t really “get” the title (it doesn’t give you any idea what’s inside, and perhaps equally significantly doesn’t entice you in any meaningful way). Read on below to get a more detailed idea of what’s inside; I’ve captured the main ideas, but there are so many more great examples that I didn’t reproduce. Syed begins Bounce by recounting his own against-the-odds success story, in which from humble beginnings he rose to become Britain’s top-ranked table tennis player, a two-time Olympian, and three-time winner of the Commonwealth Games. He then retells this story with a slightly less romantic view, one that highlights the circumstantial good fortunes (a table at home, a skilled older brother, a fantastic local coach, and a top-notch local club) that were responsible for his success. After setting this stage, he dismantles the idea of sports as being a perfect meritocracy, and positions sporting success as a product of opportunity and practice. Syed asks, what is talent, and introduces the reader to Anders Ericsson, a psychologist at Florida State University who has extensively studied the causes of outstanding performance. As reported by Syed, in his studies Ericsson has found that “Purposeful practice is the only factor distinguishing the best from the rest” (p13). That is, any complex task requires a minimum of 10 years of purposeful practice; at about 1,000 hours per year on average, that works out to 10,000 hours (popularized in the mainstream by Malcolm Gladwell in Outliers). Why is this discovery so profoundly important? But what about those athletes (and experts in other areas) who experience overnight success? This is what Ericsson refers to as the ‘iceberg illusion’, “When we witness extraordinary feats of memory (or of sporting or artistic prowess), we are witnessing the end product of a process measured in years. What is invisible to us – the submerged evidence, as it were – is the countless hours of practice that have gone into the making of a virtuoso performance.” (p22) In his research, Ericsson sees the incredible potential of ordinary people, and the great tragedy is that most of us still believe that talent is innate. Next, Syed tells us the story of Desmond Douglas, described as the greatest ever UK table tennis player. Syed uses the story to illustrate how Douglas’ success is owed not (as originally suspected) to superhuman reaction time, but to the specialized development of a ‘visual chunking’ capability that experts develop only after the requisite thousands of hours of practice. This chunking will appear throughout the book and be explained in wonderful detail. Syed shifts sports and focuses for a bit on Roger Federer, and introduces the reader to the concepts of implicit memory (otherwise known as expert-induced amnesia) and explicit memory: “Great shot-making, then, is not about developing ‘muscle memory’; rather, the memory is encoded in the brain and central nervous system”. Very neat stuff indeed! We’ve all seen stories about child prodigies – children who display remarkable innate talent in a particular field. Well, prepare to change how you think about these stories. Using one of the most famous child prodigies in history, Mozart, as a subject, Syed shows how stories of child prodigies are actually fanciful marketing and in fact add further support to the 10,000 hour rule. To provide more evidence, Syed runs through other examples, including Tiger Woods, Venus and Serena Williams, and David Beckham, illustrating in every case how the remarkable success was based on nothing more remarkable than accumulating the requisite hours of purposeful practice. Moving onto one of my personal favourite sports, Syed explains how futsal is a foundation of Brazil’s national expertise in futsal’s cousin, soccer. From here, he shifts to basketball to illustrate some effective training techniques before stating, “It’s easy when traveling across the terrain of elite sports to be overwhelmed by the seemingly endless diversity of training methods. But scratch beneath the surface, and you will find that all the successful systems have one thing in common: they institutionalize the principles of purposeful practice.” (p90-91) For anyone to become a true expert in any field, they need a combination of circumstance, the right training system, appropriate facilities, and great coaching. Note that “natural born talent” is absent from that list. “OK”, some readers might be thinking, “I get that mind-set is important, but can your mind-set be changed?” The positive news is yes! Again citing Dweck’s studies (absolutely fascinating and just mind-blowing, by the way), Syed shows just how easily one’s mind-set can be changed (but beware, because it works both ways). In short, praising effort is good, and praising intelligence is bad. This chapter begins with an examination of the preponderance of superstition in sports, listing a number of famous and funny examples (and I’m sure you can think of your own). As an avid and active soccer player, I’m particularly repulsed by the example of goalkeeper Mark Schwarzer, who apparently has worn the same pair of shin pads since he was sixteen. It turns out that athletes are very similar to pigeons in that “they both (witness) a random connection between a particular kind of behavior and a desired outcome, and (wrongly) inferred that the relationship was causal”. (p204) In other words, an athlete did something once and had a good day, so kept doing that thing in perpetuity. Syed explores the evolutionary roots of this behavior, showing how it probably kept many of our ancestors alive in more dangerous times. But why might superstitions actually prove effective? That’s right, our good friend the placebo. Not that I expect you to pity our (usually) well-compensated athletic heroes, but it turns out that winning often feels like the worst thing that has ever happened to an athlete. In fact, these anticlimactic feelings of depression might be part of the constitution that allows or drives our most successful athletes to reach new heights. By now, Syed has mentioned “perceptual chunking” a few times without explaining it; well, that’s about to change. Syed quickly reviews how we humans perceive the world, and asks what it is that makes top athletes seem to perceive faster, smarter and deeper than the rest of us? Syed explains, using more scientific studies, that knowledge is embedded in perception, so experts in any field (e.g., firefighters, tennis players, etc.) literally see and hear the world (in their area of expertise) differently than non-experts. Again, we’re touching on implicit changes in the brain that are the result of 10,000 of purposeful practice. This phenomenon is why experts are able to apply the conscious mind to other tasks, like thinking about strategy, while the rest of us would be struggling to perform. Syed closes this chapter by discussing the phenomenon of inattentional blindness, which is blindness to everything except the single thing on which you’re focused. Inattentional blindness occurs because our attention has a fixed capacity. He brings up some powerful examples, including the famous basketball video (an attention test) and the tragic case of Eastern Airlines Flight 401. Chapter 10: Are Blacks Superior Runners? Syed uses this chapter to address some questions that readers might have raised, and to address some long-held and utterly offensive stereotypes. First, he obliterates the notion that that “blacks”, as a broad racial group, share genetic characteristics that make them predisposed to athletic success and states: “For decades scientists and laypeople believed that racial groups possessed unique genetic traits not shared by other groupings, but this has been proved to be entirely without foundation.” (p265) Anticipating objections from readers, he shows how there are some conclusions that can be drawn about particular groups being disproportionately high-achievers, but that this achievement is localized to very precise geographic origins and is actually the result of (you guessed it) countless hours of purposeful practice.